Take advantage of cheap Aer Lingus flights from Dublin to Manchester and explore one of the fastest growing cities in the UK. Manchester has produced many iconic bands and remains a leading city for live music. As well as its famously vibrant nightlife, it is also home to two of the UK's biggest football teams, the fascinating John Rylands Library and fantastic shopping facilities. Fly to Manchester from Dublin with Aer Lingus and discover this energetic city. Catch a quick and affordable flight from Dublin to Manchester and enjoy easy access to the north of England. Choose a convenient departure flight to Manchester from Dublin Airport Terminal 2 and you can save time by checking in up to 30 hours prior to departure via the Aer Lingus website. 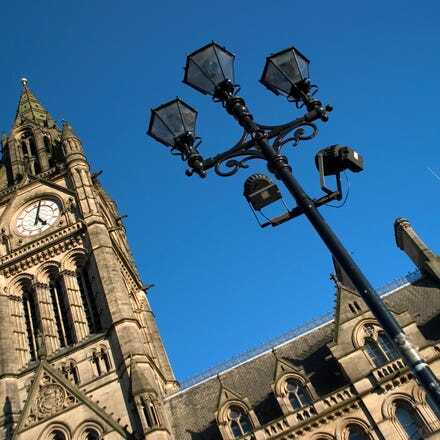 Upon arrival in Manchester, take advantage of the frequent train and bus services running into the city centre. Or if you're looking to travel further afield, why not hire a car at a discounted price from our travel partners? Manchester's museums celebrate Manchester's Roman history, rich industrial heritage and its role in the Industrial Revolution, the textile industry, the Trade Union movement, women's suffrage and football. A reconstructed part of the Roman fort of Mamucium is open to the public in Castlefield. The Museum of Science and Industry, housed in the former Liverpool Road railway station, has a large collection of steam locomotives, industrial machinery, aircraft and a replica of the world's first stored computer program (known as The Baby). Manchester Airport is just under ten miles from the city centre. There’s a combined railway and bus station on site, which means you can easily travel to Manchester (the train takes around 20 minutes, and the bus takes around half an hour) and other major cities around the country. The airport buses to the city leave every half hour, and the trains leave every ten minutes. If you’d prefer to take a taxi, the journey will take just under half an hour. Manchester is often dubbed “Britain’s second city”, so it’s not surprising that its public transport network is extensive and efficient. As well as plenty of buses and trains, there’s the superb tram system (Metrolink). For unlimited travel inside the city, you can buy a Day Saver ticket on board. If you need to head south from Manchester, frequent trains to London leave from Manchester Piccadilly, the city’s largest railway station. It’s easy enough to hail a black cab in Manchester. Remember, if the taxi sign is lit, that means the cab is free. If you don’t have cash handy, be sure to check with the driver before you set off that you can pay with card.